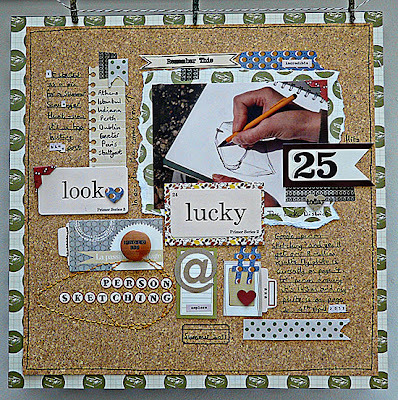 Hello!﻿ It's Sian here with another couple of layouts I made using Leo's lovely kits. 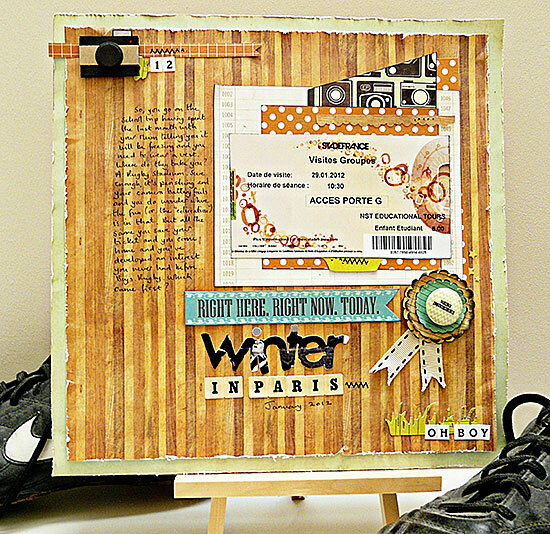 Everything in this layout from "Say Cheese"
This is a story about a visit my daughter made to a French Rugby Stadium. It was freezing and her camera battery died; but she enjoyed it enough to bring back her ticket. I wanted to use it on a layout and then I decided to include the photo in another way. I chose a black and white picture of some school friends playing rugby and used my Slice to cut out a title (cutting a pattern first so I could decide which part of my photo to use). Worth a try? I like the idea of using it with a page of memorabilia, programmes and tickets and then a big photo word. A rivhly coloured photo would look great with the monochrome papers in these kits. Both of those photos were in the original post (and the recipe is here if you are interested! )- I had no idea that a kit which would pull them both together colourwise was going to arrive on my doorstep a few weeks later. Every post was to include a picture of the host opening the door, so I found a chipboard house to draw round to emphasize that idea. What I like about this one is the way it allowed me to include the important part of the photo without taking up space I really needed for journaling. Keeping it small, using a shape which relates to my theme and using it as part of a cluster (and not floating randomly across the page!) all help to keep it looking fresh. Go on..try it. You might love it.. I loved the Kesi Art graph paper (and the paper tape and the crisp white cardstock..) so much it made me want to try something I've only done a couple of times before. A layout pulled together entirely from black and white supplies. It's certainly an easy way to start! No colours to dither over? How quick is that! It's a great chance to mix some patterns too. And a good way of experimenting with texture. Build up a few layers of tone on tone texture without any fear of things not matching! And I like it much better this way. So my tip for today? Use black and white as a base﻿ for any other colour you like. It's worth trying once. And if you do - don't forget to add your layout to this month's link. I'd love to see. Oh, and the book? The best tip in there is one I already knew, but had never really thought about: Your camera phone is with you all the time, so it's there whatever you are feeling. Use it to capture emotions. Wow, what a thought provoking post from Sian, lots of interesting points to ponder on. I personally don't want to contemplate a world without photography too long although I guess we'd still just be painting one another. Hey, that's made me think. With digital photography now do we just keep our 'best' photos? Or ones that are edited majorly? Do we photo edit our photo lives just as much as the old grand masters idealised portraits for their rich clients. :) I think I'm about 50/50 I like to edit photos but then I also like 'in the moment' snapshots - most of the time they're defo the best ones and I kind of miss old film photos for this very reason. Anyway I'm getting off track - told you there was lots of pondering to do, great post Sian! 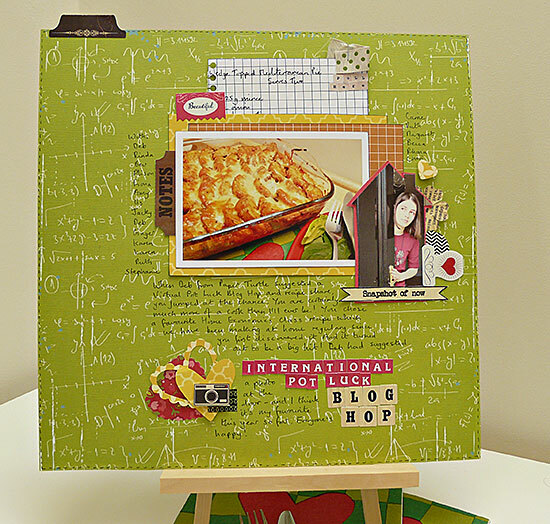 Here's what I've got for you today - I finished a layout using items from the Lite kit 'Say Cheese'. First I measured the photo and then placed it on a scrap of cardstock then marked an equal boarder of about 4mm around the top and sides. I made the base of the frame 2cm. You'd need to change the size of the boarder to what looks right for your particular photo size. Once the frame was drawn I cut it out and then placed the photo back on the piece to draw around. You'll need to make the inner frame slightly smaller than the size of your photo so use the drawn line as a guide and then draw the inside frame with a ruler a couple of mm smaller. Cut the inner frame out. 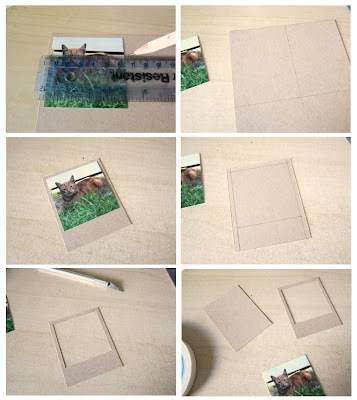 Use another scrap of card the same size as the backing; mount your photo onto the backing piece then glue the frame over the top to finish. 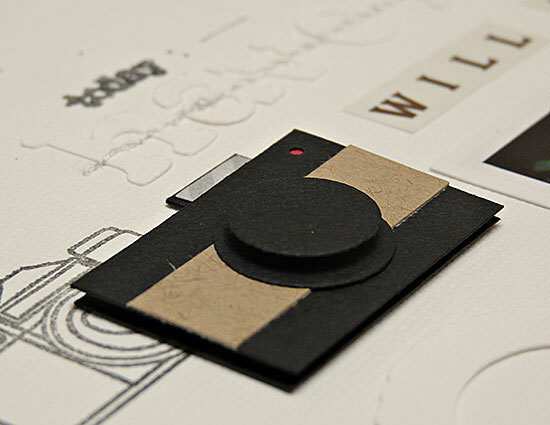 To build the layout I began with the Echo Park solid colour cardstock from the kit. I cut two strips from the Echo Park 'Vintage Fans' paper, one 2 inches wide and the other 1 inch wide. The larger strip was glued along the top edge with a border sticker from the alpha sticker sheet underneath it. The smaller strip I glued along the bottom edge. I used one of the stickers from the alphabet sheet and fixed it on the layout about 4.5 inches from the top. I'll be using this as a guide to place the rest of the papers. I couldn't decide which paper to use so I cut out little random pieces from a few of them and cut out some of the tickets from the 'Tickets Please' Echo Park paper. I layered them together using the sticker as a guide across the layout. The Kesi'Art paper with the numbers on had a sprinkling of white ink across one corner printed on it so I decided to echo that and add a spray of white ink emanating from that paper. For the journalling I used a scrap of card cut into a label shape then stitched around the edge. To fix the badge to the layout I've just used a foam pad pressed onto the back. 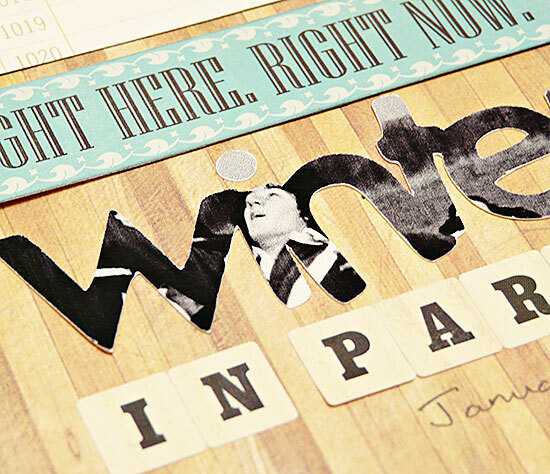 That went alongside one of the camera embellishments from the kit and I also cut out some of the cameras from the Echo Park paper to add to the layout as embellishments. Have fun with your Quirky Kit Lite and don't forget to link up what you've made using yours. Hello there. I'm Sian Fair and I'm delighted to be here! I'll be popping up over the next few weeks with my projects from Leo's latest selections: the very wonderful "Photo Op" and "Say Cheese"﻿. Kits themed around photos have got me thinking about - photos, of course. We all talk a lot about the pictures we choose for our pages. But how often do we make layouts about photos? Where the photo isn't telling the story - because the photo is the story? 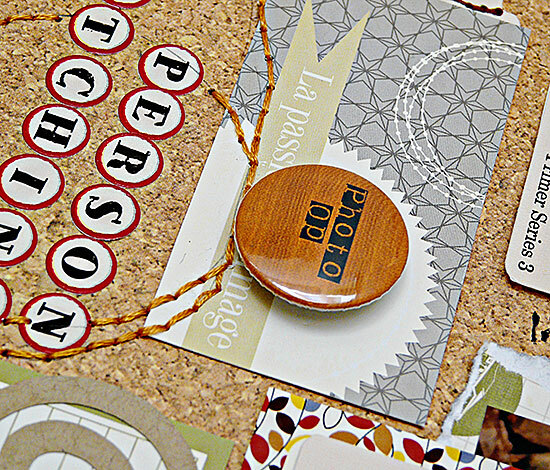 I've used the pinboard paper to create a cork board effect, with the paper tape and stitching and a photo corner punch all "holding" a selection of pieces to the page. I also used the tape to cover the little wooden clothes pegs I pin my layouts up with and I think I'll be making a few more to use on a layout too. The stitching round the outside is fake - sewn with the sewing machine without thread in to make the holes and then drawn on. Works if you run out of the thread colour you need! Last summer I took part in a photography scavenger hunt. One of the things we had to find was a "person sketching outside their house". And my photo was a bit of a cheat. I had taken it the year before, just a quick snap to show someone the zoom on my camera; but I posted it. And now? I have discovered that it is slowly working its way up the rankings on google searches for pictures of people drawing. It gets me lots of extra hits a week to my blog! I thought that was worth a page. 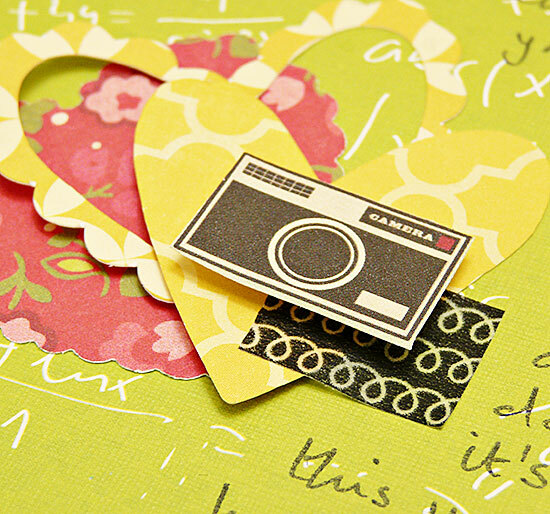 So my challenge for you today is to make a layout with a QUIRKY photo from your collection. Don't just use the photo to illustrate your story. The photo IS the story. - If you could only save one photo from all the hundreds you have, if everything else disappeared, which photo would that be? - If you could go back in time and take a photo you didn't have, what photo would that be? - Have you had a favourite camera over the years? Did your family take lots of pictures when you were growing up? - How many photos do you take every month? Or something even harder - what if photography hadn't been invented? - But we'd remember anyway. Wouldn't we? What do you think? Could there be a layout in that? I'll be back later in the month with more photo thoughts. I've got "Say Cheese" to play with next. But in the meantime, don't forget to download Leo's PDF for the mini book. That cork board paper needs to be used, whatever way you go! Here’s a little idea to try over the Easter holidays using your kits. 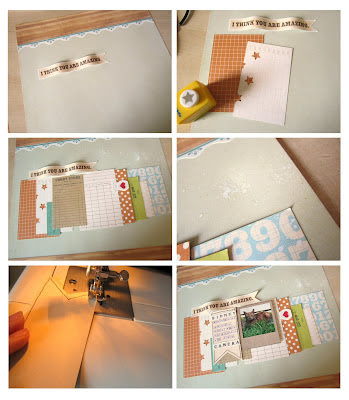 How about making a mini scrapper book? A little journal you can fill in yourself with photos or hand over to the kids to fill in to tell their story of the holidays or maybe a fun day out. 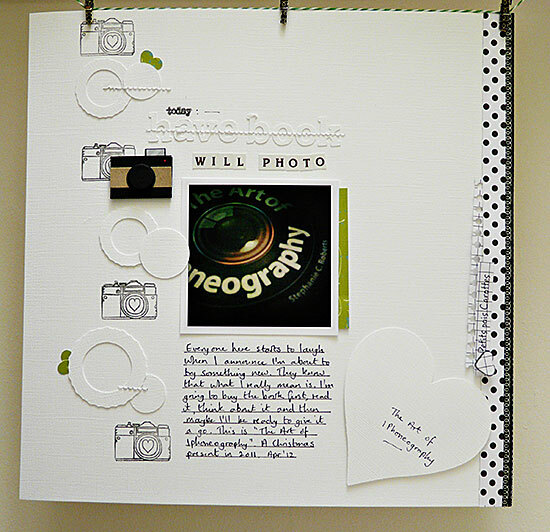 It's got a nice chunky spine so you can add lots of embellishments and bulky mementos to the pages inside but it's small and neat enough for you to pop on a scrapbook page or inside a scrapbook page protector to store. I've written out the instructions in a PDF for you so you can choose to print it out or add it to your Kindle or tablet PC to follow along. Click here to download the Mini Scrapper Book Instructions. 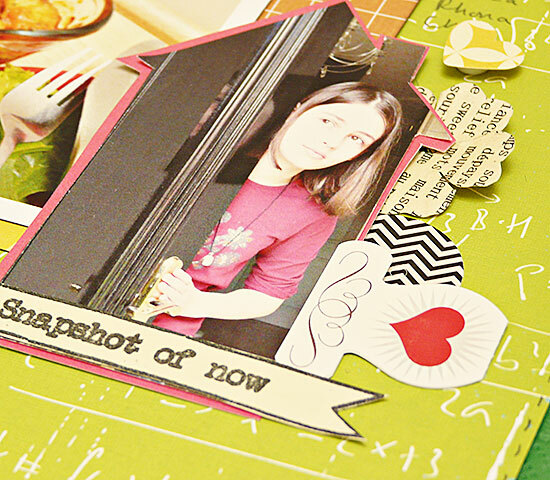 So here we go link up to what you've made with your 'Photo Op' and 'Say Cheese' Quirky Kits. If you can't use the Mr. Linky widget leave a link in the comments instead. I'll also add a link to this post on the sidebar so you always know where it is as you make things throughout the next couple of months or as you want to peek at what other users are making with the current kits.